Whether you are caring for an adult in your home or they are still in their own home, you will find valuable information here. Learn about availability of in-home nursing care. We provide features to help you balance independent living with health or safety concerns. Keeping track of important information can be difficult. In the event of an emergency, you will want to have all of it handy. This workbook enables you to collect vital information and use it to save time when visiting with your loved one's doctor or other advisor. You do NOT store information on a computer -- you keep it with you at all times so it remains secure and private. Chat Guide -- A full schedule of real-time chat with other caregivers, professionals and guest moderators. The ElderCare Forum UPDATED! -- Post questions, give answers, or share your experiences and tips and receive e-mail responses with our state-of-the-art message board. The Caregiver Support Network Provides a comprehensive directory of eldercare support groups on the Internet and a team of caregivers who can help you get through the tough times. Caregiver HomePages -- Visit websites maintained by other caregivers, read their online journals and learn tips. Neighborhood Network -- Find government services, aging resources and local assistance programs in the USA. Teen Resource Center Provides articles, resources and interactive features for teens who are living with a loved one with Alzheimer's Disease or other condition. Nursing Home Quality Advisor -- Find certified nursing homes and improve quality of life while there. Medicare Health Plan Analyzer -- Collect and compare information on different health plan options. © 1998-2014 Prism Innovations, Inc. All Rights Reserved. Many people don't realize the Medicare provides only limited coverage. 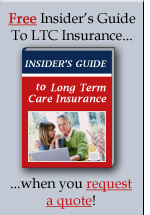 Long Term Care Insurance helps you to protect your assets and ensure that you will be cared for after retirement. Visit our Long Term Care site and we'll tell you all about it. Our series of educational booklets, workbooks and multimedia tools is now available. They are designed to help you provide better care, understand the changes associated with aging, and facilitate the hands-on caregiving responsibilities you face. Choose from hundreds of titles though our affiliate partner Amazon.com. We provide dozens of book reviews, excerpts, interviews, and chat transcripts to help you select the caregiving books that offer you the most assistance. Enter Your E-mail Address to Subscribe to Our Free Newsletter and Updates.